A programmer was walking along the beach when he found a lamp. Upon rubbing the lamp a genie appeared who stated "I am the most powerful genie in the world. I can grant you any wish you want, but only one wish." The programmer pulled out a map of the Mediterranean area and said "I'd like there to be a just and last peace among the people in the middle east." The genie responded, "Gee, I don't know. Those people have been fighting since the beginning of time. I can do just about anything, but this is beyond my limits." The programmer then said, "Well, I am a programmer and my programs have a lot of users. 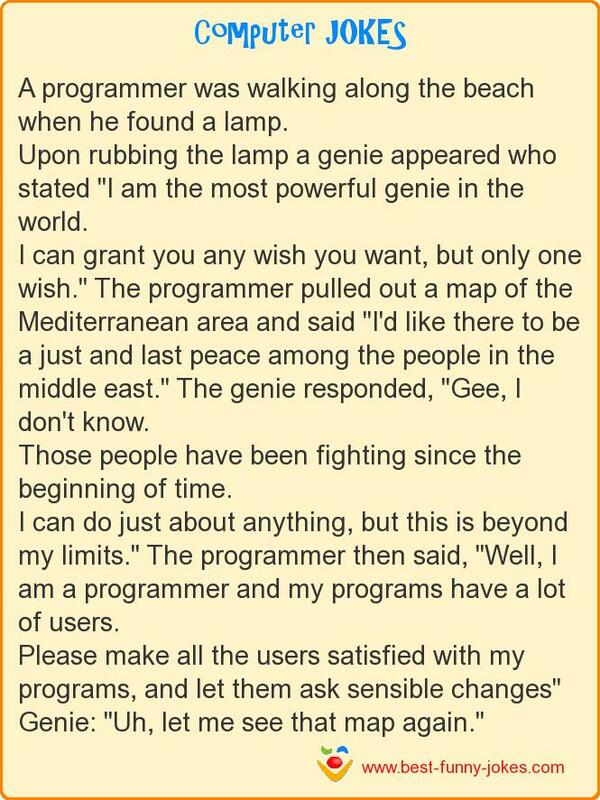 Please make all the users satisfied with my programs, and let them ask sensible changes" Genie: "Uh, let me see that map again."